Hooded coverall protecting your reusable flame-resistant garment from light chemical spray, aerosol, particulates, dirt and grime. • Proshield FR also provides limited protection against heat and flames. Warm quilted lining for extra warmth and comfort, reinforced stress points and a concealed heavy duty way YKK brass zip. Action back allows easy body movement. Two back pockets, side elastication with tunnel waistband, side swing pockets lined with sail cloth and side access, as well as stud adjustment cuffs and a hammerloop. 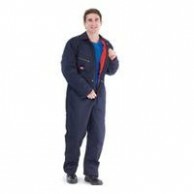 Description Dickes Deluxe Polycotton Coverall Navy Blue Other sizes or colors may be available on request. Please contact us if you have any queries Manufactured from 260g/m2 65% polyester, 35% cotton fabric.